The former Garda Press Officer Supt David Taylor has told the Disclosures Tribunal that negative briefing of the media against Sgt McCabe happened in an opportunist and random way. Supt Taylor was asked by counsel for the Tribunal, Diarmaid McGuinness if he could give specific instances of the practice. The Supt said the negative briefing could have happened at scenes of incidents, or at the sides of press conferences, or in a multiplicity of locations, and that opportunities were taken as they presented themselves. Supt Taylor gave evidence that he would draw journalists’ attention during discussions about Sgt McCabe that the whistleblower’s concerns about the penalty points issue were being brought forward because he was motivated by revenge. The Supt said he would tell journalists about a 2006 allegation made against Sgt McCabe and that he would make it clear the DPP had directed no prosecution, but he said he would say that this was the epicentre for the Sgt’s motivation. The Tribunal heard that Supt Taylor had named Paul Williams as one of the journalists he had briefed in a negative manner about Sgt McCabe. Paul Williams has denied that he was ever briefed negatively about Sgt McCabe by Supt Taylor. Supt Taylor was asked about differences between his account and that of Paul Williams, in relation to a conversation about an article he was working on about the family of Ms D, who made the allegation against Sgt McCabe in 2006. The Tribunal heard that Supt Taylor’s recollection was that Paul Williams had contacted him on the day he interviewed the family of Ms D, to let him know for information purposes. Paul Williams has previously told the Inquiry that he rang Supt Taylor about a week after he conducted the interview with the family of Ms D, and put a number of questions to him in relation to the investigation into the 2006 allegation, which Supt Taylor was to get back to him about. Supt Taylor told the Tribunal today that his recollection was that the Journalist was just ringing him to tell him about the article he was writing. David Taylor said after the conversation with Paul Williams that he had texted Martin Callinan and Nóirín O’Sullivan to let them know about the article. He said Ms O’Sullivan replied "perfect", and later rang him about the matter. Supt Taylor said that after the phone call with Paul Williams he did not speak to the journalist again about that specific matter. Earlier, Supt Taylor told the Tribunal that Nóirín O’Sullivan had been aware of the smear campaign against Sgt McCabe because the Supt said he had spoken to her on numerous occasions in relation to the matter. He said nobody else would have been present during these conversations as they would have been one-to-one engagements by phone or in person. Earlier, Supt Taylor told the Tribunal that Martin Callinan told him that the whistleblower Maurice McCabe was motivated by revenge. Supt Taylor said that the former garda commissioner instructed him to drop this into conversations with journalists. The tribunal is examining Supt Taylor's allegation, which was made in a protected disclosure in 2016, that he was instructed by Mr Callinan to brief the media negatively against Sgt McCabe and that this was done with the knowledge of former commissioner Nóirín O'Sullivan. Both former garda commissioners deny the claims. Supt Taylor gave evidence about a conversation he had with Mr Callinan towards the middle of 2013 about the penalty points controversy. Supt Taylor said Mr Callinan had told him that Sgt McCabe had been investigated a number of years previously for an alleged sexual offence, which had gone to the Director of Public Prosecutions Office and the DPP directed no prosecution. He said that Mr Callinan told him this was at the centre and the core of why Mr McCabe was engaged in a campaign to highlight issues with penalty points. Supt Taylor said that Mr Callinan had told him Sgt McCabe was driven by revenge as a result of the situation regarding the allegation against him. He said he was given specific instructions by Mr Callinan to drop this into conversations in the Dáil, on social media or with journalists. Supt Taylor told the tribunal that Mr Callinan was getting deeply frustrated over the penalty points controversy, that it was reflecting badly on gardaí and on the commisioner. Supt Taylor said anything that reflected badly on senior garda management was something that in their minds could not be tolerated. Asked by lawyers for the tribunal if he had seen anything improper in the instructions given to him, Supt Taylor said An Garda Síochána was a disciplined force, and that if the garda commissioner gave a direction or an order, you follow it. Earlier, Supt Taylor told the tribunal that he had not believed he was doing anything wrong in relation to briefing negatively about Sgt McCabe, but subsequently he did believe it was wrong. He said that when he made his protected disclosure in September 2016, he had been away from the hot house and influence of the gardaí as he was suspended from duty. Supt Taylor said he did not believe that he had told Sgt McCabe that he was being targeted because he knew too much about the alleged smear campaign against the sergeant. The superintendent was asked whether he was trying to convey to Sgt McCabe that the criminal investigation being carried out into him was without foundation or improper. Supt Taylor said the investigation into him had nothing to do with Sgt McCabe. He said he generally did not recall "pushback" when he was speaking to journalists negatively about Sgt McCabe. Supt Taylor said people would have known that he was speaking on behalf of the garda commissioner. He said he could not recall the first person he briefed negatively, but it all ended when Mr Callinan retired. Supt Taylor was repeatedly asked about the conflict between himself and Sgt McCabe on whether the alleged smear campaign was conducted by text message. He insisted the smear campaign was never conducted by text and that references in his protected disclosure to text messages related to interactions between himself and Mr Callinan and Ms O'Sullivan were general background information about Sgt McCabe. He said a reference by TD Clare Daly on RTÉ about a campaign by text message were "other people saying their words". The Tribunal has heard that Supt Taylor has a lack for recollection and specifics on when he alleges he briefed journalists negatively on Sgt McCabe. Asked repeatedly for specific instances, Supt Taylor said he could not give exact dates. He said opportunities were "opportunist" and "random" and presented themselves usually at crime scenes or events. The superintendent has named nine journalists to the Tribunal who he said he gave negative briefings to about Sgt McCabe. All have either denied receiving briefings or they are claiming privilege on relation to their conversations with the former press office. The Tribunal heard that Mr Williams, Mr Reynolds, Mr Burke and Mr McEnroe have all denied receiving negative briefings. Mr O'Toole also denied receiving any negative briefing, and he is claiming privilege in relation to his conversations with the former Press Officer. A number of other Journalists are also claiming privilege. Counsel for the Tribunal Diarmaid McGuinness said that none of the journalists had corroborated or verified anything Supt Taylor had said in his protected disclosure. He said there was a lack of recollection and specifics. Mr Justice Peter Charlton asked Supt Taylor for specific dates. Supt Taylor said he could not give specific dates. Supt Taylor also named two more journalists he said had received negative briefings - Debbie McCann of the Irish Daily Mail and Eavan Murray of the Irish Sun. Earlier, Supt Taylor said he asked Mr Callinan for the investigation file into Sgt McCabe but it was never furnished by the commissioner. The tribunal has adjourned until tomorrow. Later this week, the tribunal will also hear from Michelle Taylor, Supt Taylor's wife, and the former minister for justice Alan Shatter. 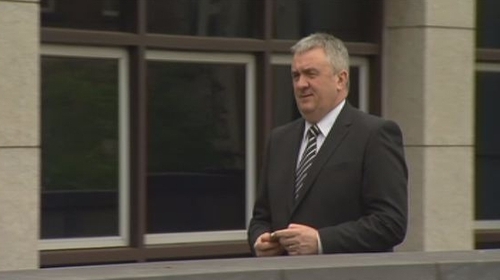 Mr Callinan is due to begin giving his evidence on Thursday.